Prairie Fire considers itself fortunate to have managed to secure this exclusive insight into the Missouri River Flood of 2011. Although we are breaking news of the report by featuring it on our website, we authorize and encourage the widespread use of the materials with proper attribution to Prairie Fire and/or linkback to this original version. We will be publishing the executive summary in the September issue of our print edition and will refer our readers to the website for the full report. January 1, 2011 – Total flood storage available in the mainstem dams was 95.3% of the total possible. Releases were scheduled to evacuate all flood storage by March 1. Rocky Mountain snowpack was 114% of normal above Fort Peck and 119% of normal above Garrison. January 15, 2011 – Total flood storage available was 96.0%. February 1, 2011 – Total flood storage available was 96.4%. Rocky Mountain snowpack decreased slightly during January and was now 112% of normal above Fort Peck and 111% of normal above Garrison. Precipitation in January was much above normal in North Dakota and Nebraska, above normal in Montana and South Dakota and below normal in Wyoming. Forecasted runoff for the basin was 27.8 million acre feet (maf) or 112% of normal. February 15, 2011 – Total flood storage available was 97.0%. March 1, 2011 – Total flood storage available was 94.0%. Rocky Mountain snowpack again decreased slightly during February and was now 110% of normal above Fort Peck and 107% of normal above Garrison. Precipitation in February was much above normal in South Dakota, above normal in Montana and Wyoming and normal in North Dakota and Nebraska. Forecasted runoff for the basin was 28.4 maf or 114% of normal. March 15, 2011 – Total flood storage available was 91.2%. April 1, 2011 – Total flood storage available was 68.0%. Rocky Mountain snowpack increased slightly during March and was now 116% of normal above Fort Peck and 112% of normal above Garrison. Forecasted runoff for the basin was 29.8 maf or 120% of normal. Precipitation in March was above normal in Montana and North Dakota and normal in Wyoming, South Dakota and Nebraska. Flooding was forecast for the Milk River in Montana and the James and Big Sioux Rivers in South Dakota (both enter the Missouri River below Gavins Point Dam) because of heavier than normal plains snowfall. April 15, 2011 – Total flood storage available was 53.8%. May 1, 2011 – Total flood storage available was 45.4%. Rocky Mountain snowpack increased dramatically during April and now was 141% of normal above Fort Peck and 136% of normal above Garrison. Precipitation in April was above normal in Montana, Wyoming, North Dakota and South Dakota and normal in Nebraska. Forecasted runoff for the basin was 33.8 maf or 136% of normal. May 15, 2011 – Total flood storage available was 41.4%. June 1, 2011 – Total flood storage available was 14.9%. Rocky Mountain snowpack was 104% of normal above Fort Peck and 127% of normal above Garrison. Precipitation in May was much above normal for the entire upper basin. Forecasted runoff for the basin was 44.0 maf or 178% of normal. June 15, 2011 – Total flood storage available was 8.8%. July 1, 2011 - Total flood storage available was 0.7%. Rocky Mountain snowpack was 26% of normal above Fort Peck and 26% of normal above Garrison. Precipitation in June was above normal in North Dakota and South Dakota, normal in Montana and Nebraska and below normal in Wyoming. Forecasted runoff for the basin was 52.5 maf or 212% of normal. Prior to May 1 we believe the system had been operated exactly as dictated by the conditions which occurred throughout the basin during spring and according to the Master Manual. Because of the heavier than normal plains snowpack which had been stored in the reservoirs and the higher than normal Rocky Mountain snowpack, most of which accumulated during April, estimated at 141 and 136% of normal, the USACE began increasing system releases on April 8. System releases were increased from 21,000 to 45,100 cfs by the end of April despite the fact that the state of Missouri was in the midst of the 5th wettest April on record and that there was already flooding occurring at Nebraska City. After May 1 we believe that the Missouri River mainstem reservoir system was operated again in accordance with the Master Manual in response to the abnormal precipitation events that kept occurring. With the expectation that the abnormal precipitation patterns would stop, the system was operated to maximize flood risk reduction. During May the Missouri River mainstem reservoir system was used to store as much runoff as possible and despite the abnormal amount of runoff there was limited flooding during May and the system still had 16% of its total flood storage available at the end of the month. Although by May 29 the USACE was predicting releases of 150,000 cfs by mid June, by storing this record runoff, the USACE was able to keep system releases below the previous record of 70,000 until May 29. We believe that the USACE choose a release of 70,000 cfs based on this previous experience, knowing that this release would cause minimal impacts while maximizing the time available for emergency flood protection activities. In order to minimize the maximum flood heights, the USACE ended up using nearly 100% of the flood storage available in the system by the end of June. The construction of chutes, backwaters, emergent sandbars and shallow water habitat have not contributed to the flood but in most cases actually increased flood storage capacity of the system resulting in reduced flood heights. We found no evidence that any management actions were taken for least terns, piping plovers or pallid sturgeon during 2011. When enacted, all fish and wildlife management actions for least terns, piping plovers or pallid sturgeon are dependent on water supply and not on the storage of water for those actions. All scheduled actions were cancelled due to the record runoff and therefore did not contribute to the magnitude, timing or duration of the flood. The flood, or the flood of misinformation about the flood, which is worse? 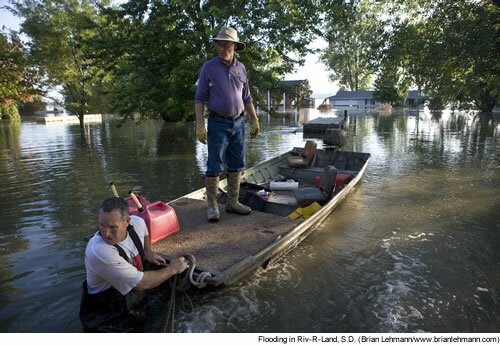 As we read the newspapers articles on the internet and visit with the farmers, homeowners, and businessmen along the river, it is obvious that the massive amount of misinformation concerning the flood, river management, and fish and wildlife management on the river, is greatly outweighing the presentation of the facts concerning these subjects. In order to put into perspective what you are hearing and reading, we will attempt to address each of these topics so that you have the ability to see for yourself what has happened in the Missouri River basin in 2011. We will use public sources of information that are readily available and try to make it clear when we are expressing our opinions. Time and time again we hear or read, “Is this a real flood”? What we began to realize is that in many of the discussions of this event the term “real flood” is being used comparatively to the term “man made flood”. So is this event a “real flood” or a “man made flood? The basic definition of a flood is the overflow of an expanse of water that submerges land. A second definition, from the internet, is a form of natural disaster when there is more water than lakes, rivers, oceans, or ground can hold. The first sounds pretty benign, while the second, although nearly identical carries obvious negative overtones. Flooding on rivers is a natural event and is expected to happen at different frequencies (i.e. 5, 10, and 100 year floods) and at different heights, on all rivers. Floods occur because the natural processes, such as erosion and deposition, that determine the dimensions of a river channel only maintain a channel capacity sufficient for flows that occur very frequently (on an annual or semiannual cycle). During intervals between high flow events, sediment is deposited on the margins and bottom of the river channel, reducing channel capacity. On the other hand, channel capacity increases during wetter climatic cycles or during flood events as more sediment is removed from the channel than is deposited. So what is a “man made flood”? We found the term being used in two different ways. The first is when a flood is artificially created such as in the management actions undertaken in the Grand Canyon to mimic a natural event that would not occur otherwise. The second is when management actions create a flood as an alternative to other more serious consequences (such as to keep a dam from overtopping or opening a floodway to keep levees from overtopping as in the cases of the Bonnet Carre and Morganza Spillways on the Mississippi River. So is the Missouri River flood of 2011 a “real flood” or “man made flood”? 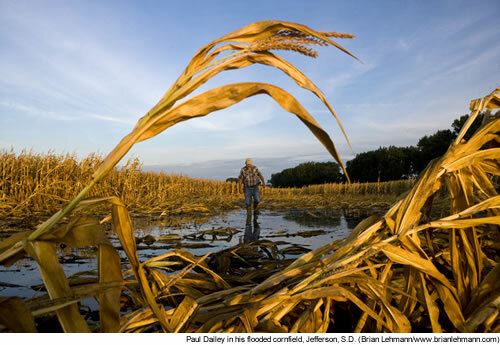 First, there has been an unprecedented and abnormal amount of precipitation in the Missouri River Basin in 2011. Data from the US Army Corps of Engineers (2011) shows the annual runoff of the Missouri River above Sioux City, Iowa since records began being kept in 1898 (Figure 1). It shows that already in 2011 the USACE has projected a record annual runoff of 57.7 million acre feet (maf), nearly 9 maf more than the previous record of 49 maf that occurred in 1997. To put this in perspective, in 2000, 2002 and 2004 the total annual runoff for the year was less than 17 maf. Several other things to note from the graph; the long term median annual runoff is 24.4 maf, the drought period that occurred in the basin from 2000 to 2007 has ended and that the three highest annual runoffs ever documented occurred in 1978, 1997 and 2011 and are showing an increasing trend. The second notable aspect to this runoff is where and when in the basin that it originated. Runoff in the Missouri River basin originates from three sources; melting of the plains snowpack in March and April, melting of the Rocky Mountain snowpack in May, June and July, and rain anytime throughout the basin. We will attempt to talk about these separately with the understanding that there is quite a bit of overlap and connectivity between these three sources of precipitation. 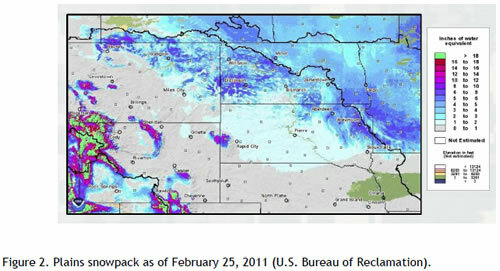 At the end of February 2011, the plains snowpack covered portions of northeast Montana and most of North and South Dakota (Figure 2). In late March 2011, the National Oceanic and Atmospheric Administration (NOAA) was forecasting an increased risk of flooding on the Milk River in Montana and along the James and Big Sioux Rivers in the Dakotas, both of which enter the Missouri River below Gavins Point Dam and thus cannot be regulated by dam operations. This was because of heavier than normal snowfall and colder temperatures, which prohibited melting over much of the winter, in these areas. Rocky Mountain snowpack which had actually declined during January and February increased slightly during March and as of April 1, 2011 was reported as 116% above normal above Fort Peck and 112% above normal above Garrison (Figure 3). For comparison, this was much less than on the same date in 1997 which was the previous record runoff (Figure 3). Heavy snow during April increased the snow pack to 141 and 136% above Fort Peck and Garrison. The snowpack water content for the Rocky Mountains shows this large increase during April (Figure 4) (snowpack water content is the amount of water contained within the snowpack and can be thought of as the depth of water that would theoretically result if you melted the entire snowpack instantaneously). Snowpack accumulated until the middle of May above Fort Peck when normally snowpack in western Montana would peak in mid to late April. In the mountains around Yellowstone and in Wyoming snow continued to accumulate until early June in 2011 when normally the snowpack in this area would peak at the end of April. The amount of snowpack water content received in 2011 was approximately 6 to 8 inches or 35 to 40% above average. This significantly greater than average snowpack water content was not consistent with the long term trends that have been documented for both the Rocky Mountains and North America. Another important detail to note from Figure 4 is the much later than average snowmelt. In summary, snowpack in the mountains of the Missouri River basin was only slightly above average until middle to late March, after which time large amounts of snow accumulated through the middle of May into June and that the runoff occurred nearly a month later than average. Precipitation also came to the Missouri River basin in the form of snow on the plains in North Dakota, South Dakota and Nebraska in January and especially in South Dakota and Missouri during February (Table 1). These totals are for the entire state and except for Nebraska these totals for the other states include a small amount of precipitation that fell outside the Missouri River basin. Generally the amounts of rain on the plains were slightly above average during April with the exception of heavy rains in Missouri. Near record rainfall throughout most of the Missouri River basin during May was a major contributing factor to the 2011 flood. Much of eastern Montana received over 8 inches of rain (Figure 5) during the month of May making it the 3rd wettest May ever for Montana (Table 1). Northern Wyoming, western North and South Dakota, and the entire states of Nebraska and Missouri received over 5 inches on average. These heavy rains in combination with the late snowmelt resulted in a record runoff of 24.3 maf for the months of May and June which is nearly the historical median runoff for the whole year (Figure 1). May runoff was 266% of normal for the Fort Peck reach, 355% for the Garrison reach, 403% for the Oahe reach, 207% for Fort Randall reach, 100% for the Gavins Point reach and 549% for Sioux City reach. Even though 2011 was a wet year in the Missouri River basin, by comparing the distribution of precipitation across the basin in 2010 it is easy to see the magnitude of the rain events that occurred especially in the upper basin (Figure 6). In order to put what has happened in the Missouri River basin this year into a larger context we compare what happened to the precipitation received across the country this year (Figure 7). Starting again with the Missouri River basin; we see precipitation ranging from below to much above normal from January through April, with much above normal precipitation in the entire upper basin in May with some lingering higher levels of precipitation in the Dakotas in June. The northeast and especially the Ohio valley began the year with below normal precipitation but received above normal precipitation beginning in February culminating in all time record precipitation for all six states of the Ohio River valley in April. From Arizona all the way across the south there has been a severe drought with several of the driest months ever recorded in the states of New Mexico and Texas. California on the other hand started out dry and then had the wettest June ever recorded while the upper northwest started out dry and then received very large amounts of precipitation in March, April and May. The Missouri River is over 2,300 miles long and the Missouri River basin encompasses 529,350 square miles, spans parts of 10 states and two Canadian provinces and drains 1/6 of the United States (Figure 8). Extensive flooding in the basin and around the country prior to and during 1943 resulted in the Flood Control Act of 1944. The Pick Sloan Plan was the plan adopted for the Missouri River basin and resulted in the largest reservoir system in the United States, with a capacity of 73.1 million acre feet (maf) or 23,819,708,100,000 gallons (trillion) in just the six mainstem reservoirs (Figure 9). The authorized purposes for these dams were flood control, navigation, irrigation, power, water supply, recreation, fish and wildlife and water quality. In addition to Fort Peck Dam which was completed in 1940, five additional multipurpose mainstem dams were built and they as a system became fully operational in 1967 (Ferrell 1993). These dams are currently operated with a total of 16,268,000 maf of flood storage (Figure 9). The carryover multiple use is used to support navigation, hydropower production, drinking water supply, irrigation and fish and wildlife. The Missouri River is operated by the U.S. Army Corps of Engineers following the Missouri River Mainstem System Master Water Control Manual or Master Manual. There is a “master” manual for the Missouri River basin because there are multiple projects (i.e. dams) including dams on the tributaries which must be operated as a hydraulically and electrically integrated system. There are project manuals for each individual project but they are operated, except in extreme emergencies, in accordance with the Master Manual. It should also be understood that the Master Manual is just the operational guidance document; the USACE must operate their projects in accordance to all other applicable federal laws including the Endangered Species Act, the Clean Water Act, etc. The Master Manual itself is a topic much more complicated and probably more controversial than the topic we are writing about. Therefore we will only attempt to give a brief overview of the Master Manual and its role in management of the Missouri River. The Master Manual outlines the operating philosophies and describes the considerations for planning project operations (Ferrell 1993). Figure 10 contains the introductory language from the 1978 Master Manual (published in 1979). An annual operating plan (AOP) is developed which takes all of the priorities and the functional relationships between alternatives (each management action impacting other actions) and presents these as operations. Implementing the AOP means coordinating three main elements; water supply, water needs and scheduling for optimum water management. The first Master Manual was prepared in 1960 and because water management was as controversial then as now, there were public meetings held to gather input for the process. It was reviewed and updated in 1979 to deal with the numerous issues and new laws that had arisen in the intervening years. In 1989 the basin states governors requested that the Master Manual be reviewed and updated again. It was quickly realized that an Environmental Impact Statement would have to be written because of the range of impacts on fish and wildlife. This process took 14 years and the Master Manual was updated in 2004 and then revised again in 2006 in response to the 2003 revision of the US Fish and Wildlife Service 2000 Biological Opinion to insure compliance with the Endangered Species Act. Congress never prioritized the authorized purposes but rather left it up to the USACE and the people of the basin to develop a multipurpose plan which would optimize the development and utilization of the water resources of the basin. We will give a brief summary of how the Missouri River is currently operated under the Master Manual, but the Master Manual is freely available on the USACE website, as are the historical flow records from the United State Geological Survey, so that it is possible for anyone to evaluate past system operations. What has evolved over the past 60 years is a system that is operated at all times for maximum flood risk reduction benefits, as they have been designed into the system (see Figure 9). In our experience there has never been an instance when the USACE has not done everything possible to eliminate or minimize the impacts of downstream flooding. But in the absence of flood risk reduction measures, what has also evolved is a system operated to maximize navigation benefits. It turned out that the preferred water management plan to maximize navigation benefits also does a good job of meeting the needs of hydropower, water supply, water quality and irrigation. But this plan to maximize navigation benefits resulted in severe depletions in the reservoirs during drought cycles which in turn had large negative impacts on the fish populations, recreational fisheries and recreational industries associated with these large reservoirs. In addition, the reengineering of the channel for navigation and managing the flows to eliminate the natural variability to support navigation resulted in huge negative impacts to fish and wildlife. These include over 50 native fish species that are declining, several species of fish and birds listed as endangered or threatened and numerous other documented impacts. This reengineering of the channel also opened up a significant portion of the floodplain to agriculture and urbanization through accretion of lands and building of levees. The Master Manual has evolved over time to include provisions to lessen the impacts on the recreational industries on the reservoirs during drought cycles and to promote recovery of the endangered species always within the context of managing a multiuse system. The 2006 Master Manual is 432 pages long and is made up of 8 different sections with appendixes. Section 1 contains a brief introduction, Section 2 is the legislative and construction history, Section 3 is a description of the Missouri River basin with a detailed description of runoff, Section 4 is a description of the projects and the river and includes details of the physical components, channels and floodways and the control facilities, Section 5 describes the data collection and communication network, Section 6 describes how the hydraulic forecasts are developed, Section 7 is the current water control plan and Section 8 describes the water management organization for the basin. The appendices contain additional information on the authorized purposes, ongoing studies and adaptive management. Section 7, the current water control plan is the guts of the document. The plan describes, in detail, the operating procedures to coordinate the three main elements of water supply, water needs and scheduling for optimum water management. The reservoirs and system are operated with several basic storage provisions and principals which include ‘permanent pool zones’ to maintain minimum power heads, minimum irrigation diversion levels, and minimum reservoir elevations for the water supply, recreation, and fish and wildlife purposes and ‘exclusive flood control zones’ which are reserved exclusively for the regulation of the largest of floods and generally be kept empty (Figure 9). The ‘annual flood control and multiple use zones’ provide additional flood storage. The two flood control zones are evacuated on an annual basis, usually by March 1 and are used to maximize service to other authorized purposes. System regulation is described as an annual cycle where the system peaks, usually in July from runoff, and then system storage declines until late winter when the cycle repeats. This seasonal cycle of water supply from snowmelt and rain and water use for hydropower, navigation, irrigation and fish spawning is shown in Figure 11. There is also noted the regularly scheduled public meetings to gather input into the AOP development process. The system is operated based on water supply by selecting a level of service to meet the authorized purposes and determining the flow targets needed to achieve that level of service. During normal runoff and drought conditions this process occurs three times a year. During conditions of high water this process takes place as frequently as needed. March 15 to determine if navigation will be supported and at what level. July 1 to determine the level of navigation for the rest of the year and the length of the season. September 15 to determine the winter release rate. These determinations are not discretionary, but based on Plate VI-1 of the Master Manual (Figure 12). On each of these dates, the system water supply, which is the combination of water in the mainstem reservoirs, forecast calendar year runoff and tributary storage, is calculated. The water supply is then applied to Plate VI-1 and the level of service is determined. When water is scarce, a minimum service level such as 29 or 32 might be provided for navigation. This would mean that the minimum amount of water that is necessary to meet the targeted flows of 25,000 cfs at Sioux City and Omaha, 31,000 cfs at Nebraska City and 35,000 cfs at Kansas City is released from the dams. Full service is 35 or above and when water is abundant the service level might be expanded and the navigation season extended for up to 10 days. There are obviously many factors to consider when dealing with all of the different scenarios of water supply, water needs and scheduling but for this discussion we will simply focus on those related to floods. The ‘exclusive flood control zones’ which represent 4.7 maf of total system storage volume and the ‘annual flood control and multiple use zones’ which represent 11.6 of total system storage volume are used annually for the capture and storage of runoff (Figure 9). These storage volumes have been determined using all available historical runoff information while attempting to maximize the benefits to all authorized project purposes. It must be repeated that the Missouri River is managed as a multipurpose system operated to optimize the development and utilization of the water resources of the basin and is not operated exclusively for flood control. To operate the system exclusively for flood control would have major negative impacts on hydropower, navigation, water supply, water quality, irrigation and fish and wildlife under many water supply scenarios. Water would not be available when needed to support these purposes of the system and the system would enter drought cycles with lower levels of system storage resulting in huge negative impacts. The plan for water management on the Missouri River for 2011 is laid out in the “Missouri River Mainstem System 2010-2011 Annual Operating Plan” and was to have the flood storage in the system evacuated by March 1, 2011 and because the reservoirs had refilled after the drought, to provide “good service to all authorized purposes” during 2011 (USACOE 2010). It was noted that “due to the large variability of reservoir levels in recent years, the unbalancing of the three reservoirs to benefit reservoir fisheries and the endangered interior least tern and threatened piping plover will not be implemented in 2011. Additionally, experience has shown that storing water in the annual flood control zone, particularly at Oahe, as the current criteria requires in order to implement unbalancing is undesirable due to flood control impacts” (USACOE 2010). Prior to a discussion of the 2011 water year and river management we will present three figures with a total of 18 graphs that illustrate several important variables. Figure 13 presents the lake elevation by date for the six mainstem reservoirs in order from upstream to downstream (Fort Peck Lake, Lake Sakakawea, Lake Oahe, Lake Sharpe, Lake Francis Case and Lewis and Clark Lake). It also shows which storage zone each lake was in by date. The surcharge zone is created by using the gates after they are raised to raise the level of the reservoir above the standard maximum pool and was created and used on Fort Peck Lake and Lake Sakakawea in 2011 to provide additional flood storage. Figure 14 presents the amount of power plant discharge and spillway discharge for each reservoir by date. In addition for the five lower reservoirs it shows the amount of water discharged from the next reservoir upstream and the cumulative inflow of this discharge and any new water coming into the system between those two reservoirs. The amount of new water entering the system between the two reservoirs would be the difference between the red and green lines and reflect tributary flows, rain and snowmelt. Figure 15 presents the daily difference between inflows and discharges from each reservoir and shows when each reservoir was either filling or emptying. Hopefully these figures will allow readers to see the entire system at a glance and the interconnectivity of the reservoirs. At the beginning of 2011, the system was at nearly 100% total flood storage capacity and in January and February system releases (system releases occur at Gavins Point Dam) were stepped up slightly to continue to evacuate the last remaining flood storage (Figure 16). Total available system storage started to decline by March 15 with the beginning of the plains snowmelt. Heavy plains snowmelt resulted in the Missouri River at Nebraska City, Nebraska reaching flood stage on two separate occasions in February and March (Figure 19). In the upper basin the plains snowpack had the greatest impact on Lake Oahe although Fort Peck Lake and Lake Sakakawea were also heavily impacted (Figure 14). This resulted in system storage being reduced to 45% by May 8. Heavy snows in the Rocky Mountains beginning in March and continuing through April increased the snowpack which had been approximately 110% above average to over 141% above average above Fort Peck and 136% above average above Garrison (Figure 4). In response to the plains snowmelt and in preparation of the increasing Rocky Mountain snowpack, the system releases were increased beginning on April 8 and by May 8 had reached nearly 50,000 cfs (Figure 16). On May 10 an extensive precipitation event hit Montana and the Dakotas (Figure 17). This was followed by additional widespread precipitation events on May 11, 12 and 13. On May 13 in their first “Riverwatch Daily” press release the USACE announced that they would be evacuating large amounts of water from Garrison and Oahe dams (USACE 2011). Until May 22 these predicted releases were up to 57,000 cfs from Garrison and 56,000 cfs from Oahe. On May 19th the first in another series of extensive rain events occurred throughout the upper basin (Figure 18). On May 23 the USACE issued a press release where they announced “Lots more water coming down the Missouri River - now!” and on the 24th their press release stated that new forecasts were putting the basin into “uncharted territory”. Projected releases for Garrison and Oahe were increased to 85,000 cfs which was significantly higher than the previous all time record releases of 65,000 and 59,000 cfs. In retrospect, May 23 was recognized as the day that it was realized that there would be a record flood in the upper Missouri River Basin. On May 27 the USACE issued a forecast for a peak system release of 110,000 cfs which subsequently increased on May 29 to 150,000 cfs which reflected the continuing widespread rain in the upper basin (Figure 18). These unprecedented release forecasts reflected the amount of rain that was received in the upper basin, ultimately resulting in the 3rd wettest May on record for Montana, the 2nd for Wyoming, the 12th for North Dakota, the 11th for South Dakota and the 8th for Nebraska (Figure 7). These forecasts remained in place until June 18 when projected releases were increased to 160,000 cfs. Above normal precipitation in the Dakotas during June (Figure 7) continued to contribute to the record predicted runoff for the Missouri River basin for 2011 (Figure 1). Many people throughout the basin are claiming or believe that the USACE either caused or contributed to the extent of the flood through mismanagement or could have prevented the flood by taking other management actions leading up to the flood. In order to examine the accusations we will present a timeline of water supply in the Missouri River basin during 2011. These abnormal events included heavy rain which was three to six times normal across eastern Montana, northern Wyoming and the western Dakotas and very large late winter storms throughout the Rocky Mountains. These events resulted in 10.5 maf of runoff during May which was more than 1.5 times the previous May record and 13.5 maf of runoff during June was the single highest monthly total since 1898. The runoff in just these two months is equivalent to the total average annual runoff for the upper basin and has contributed to the forecast of 57.7 maf for 2011 which is nearly 9 maf more than the previous record. Although this unprecedented amount of runoff had never been anticipated based on historical records, we feel that the USACE followed the Master Manual and made the correct management decisions for the people of the Missouri River Basin throughout the spring of 2011. Many are claiming that actions related to fish and wildlife management on the Missouri River are to blame or have contributed to the 2011 flood. In order to evaluate these claims we will first describe the principal projects on the river that are specific to fish and wildlife management or to habitat restoration the Missouri River Bank Stabilization and Navigation Mitigation Project and the Missouri River Biological Opinion. In 1980 the U.S. Fish and Wildlife Service (USFWS) determined that the construction of the Missouri River navigation project had resulted in the loss of most islands and sandbars and closure or loss of connectivity with the main channel of most chutes, backwaters, and wetlands and subsequently the loss of large number of fish and wildlife and recreational user days. In response to these losses, Congress authorized the Missouri River Bank Stabilization and Navigation Mitigation Project to restore habitats historically associated with the Missouri River in order to restore habitat diversity. Habitat restoration projects have included constructing chutes and modifying the channel control structures to allow the river to widen. Both of these types of projects restore the types and diversity of habitats that have been lost from the river. All projects have occurred on public land or land acquired from willing sellers. The Corps of Engineers provides the primary operational management of the Missouri River and is responsible under the Endangered Species Act to take actions within its authorities to conserve listed species. On April 3, 2000, the Corps asked the USFWS to formally consult under the Endangered Species Act on the Operations of the Missouri River Main Stem System, and related Operations of the Kansas River Tributary Reservoirs, and the Operations and Maintenance of the Missouri River Bank Stabilization and Navigation Project. The USFWS reviewed the project plans and determined that the operation of the three Missouri River projects under past and present operating criteria and annual plans have severely altered, and continue to alter under present operating plans, the natural hydrology and the riverine, wetland, and terrestrial flood plain habitats and fish and wildlife resources of the Missouri River and lower Kansas River ecosystems. The USFWS issued a Biological Opinion (BIOP) that stated that current operations, if continued without significant alterations, would likely cause further declines in other native species and result in additional species listed as threatened or endangered. The USFWS gave the USACE a list of actions that they felt would assist in restoring and maintaining the functional ecosystem and that would ensure that the USACEs operation of the system would not reduce the likelihood of survival and recovery of the pallid sturgeon, interior least tern and piping plover. Provide culturing and population augmentation (in the near-term) for the pallid sturgeon to ensure genetic viability of the species until the necessary habitat and hydrologic conditions are restored. establish an adaptive management framework to implement, evaluate, and modify the actions in response to variable river conditions, species responses, and increasing knowledge base.. In 2003 the USFWS issued an Amended BIOP on the USACE Missouri River Mainstem Reservoir System operations. Among other actions, the Amended BIOP called for bimodal spring pulse releases from Gavins Point Dam for the benefit of the endangered pallid sturgeon. The USFWS determined that a spring rise and summer drawdown must be implemented from Gavins Point Dam to restore, in part, spawning cues for fish, maintain and develop sandbar habitat for birds and fish, enhance aquatic habitat through connection of the main channel to backwaters and side channels, and improve habitat conditions for summer nesting terns and plovers, forage availability, and fish productivity. The USACE, in coordination with the USFWS and with the assistance of the United States Institute for Environmental Conflict Resolution, coordinated with basin Tribal representatives, States, and stakeholders in an attempt to develop a basin consensus for bimodal spring pulse release criteria meeting the requirements of the Amended BIOP. While this process was not successful in developing a basin consensus, it did assist the Corps in developing spring pulse release technical criteria for inclusion in the Master Manual. The USFWS has informed the Corps that the technical criteria for bimodal spring pulse releases from Gavins Point Dam, if implemented in conjunction with a comprehensive adaptive management strategy, will meet the intended purposes outlined in the 2003 Amended BIOP for 2006 and beyond. The technical criteria include sufficient safeguards to minimize impacts to authorized project purposes, basin Tribes, and both upstream and downstream river uses while providing potential benefits to the endangered pallid sturgeon. The bimodal spring pulse releases, as described in the technical criteria, would not be implemented in extreme drought conditions, thereby protecting upstream reservoir uses. The technical criteria do not modify existing downstream flow limits, thereby providing the same level of protection to downstream rivers users, who are concerned about interior drainage and groundwater issues, as are currently provided. In response to the BIOP the USACE has expanded the habitat restoration program on the river and focused on restoring shallow water habitat to assist with recovery of the pallid sturgeon and emergent sand bar habitat to assist with the recovery of least terns and piping plovers. In addition the USACE has implemented a spring rise to assist with the recovery of pallid sturgeon. We will look at the potential contribution to flood risk of each of these activities. To restore shallow water habitat the USACE has continued to construct chutes but has focused more on creating this habitat within and along the main channel. This has included lowering wing dikes and revetments to allow the river to widen by up to 175 feet while at the same time maintaining the bank stabilization and navigation purposes of the project. When a chute is constructed it is either dredged out and the spoil released into the river or it is dug out with heavy equipment and the spoil mounded on the banks and is intentionally released back into the river as the chute widens. The end result is that a chute removes some of the water from the main channel thereby lowering the stage of the river in that area. Rather than contributing to the flood the chute actually reduces the impact of the flood by increasing total capacity of the river system. In the main channel the river is widened by lowering or removing selected wing dikes on the inner or filling bank or by removing the upper portion of the revetment on the outer or cutting bank. Both of these are intended to promote erosion of the high bank of the river resulting in a wider main channel. While at normal flows this is expected to result in more shallow water, at higher flows this increased area between the high banks would decrease the stage of the river in that area, again reducing the impact of the flood. To restore emergent sandbar habitat which must be free of excessive vegetation for successful nesting, the USACE either removes vegetation from old sandbars or constructs new sandbars. Removing vegetation would obviously not contribute to floods. New sandbars are constructed by excavating sand from the bottom of the river in the immediate vicinity or by excavating the material from the floodplain creating a backwater in the process, as was done at Ponca State Park. Because the first method only rearranges sand within the channel there is no impact on floods. The second method adds sand to the channel but results in construction of a backwater. The impact of the newly created sandbar is offset by the storage capacity of the newly created backwater. As the sandbar continues to erode the impact of the backwater continues to increase actually resulting in the flood stage decreasing in that area until the sandbar is completely washed away. The spring pulse is one of the most controversial aspects of fish and wildlife management on the river. Most of this controversy stems from the fact that very few people understand the spring pulse. Before dams were built along the Missouri River, water levels changed drastically during different times of the year. Snowmelt from the plains and mountains, along with increased rains, caused the river level to rise twice each spring, creating a bimodal spring rise in Missouri River flows. These natural shifts in water levels redistributed sediment and nutrients along the river. The spring rise created new habitat for nesting birds by clearing off vegetation from sandbars and removed silt from pallid sturgeon spawning sites. The spring rise also served as a reproductive cue for many species of the Missouri River. These species, including the now-endangered pallid sturgeon, timed their spawning or birth cycles with the spring rise. There was also a floodplain connectivity component to the spring rises which provided safe places for newly-hatched fish, turtles and birds to feed, grow and mature. As mentioned above, the USACE attempted to get the tribes, states and basin stakeholders together to design a bimodal spring pulse that everyone could live with. This did not happen, but what did result were the criteria for conducting each spring pulse. These criteria are listed each year in the AOP (Figure 20). The March pulse is set for two days at 5,000 cfs over the projected navigation flows but no greater than 35,000 cfs and the May rise is set at two days at no more than 20,000 cfs and then adjusted based on drought conditions if present and the forecast runoff. But the most important things to note are that spring pulses do not change flood control constraints and that no water is stored to conduct a spring pulse. But rather the decision to conduct a spring pulse and the magnitude of the pulse are both based on existing system storage and the decision to conduct a spring pulse and the size are adjusted accordingly and shown in Figure 21 for the five possible runoff conditions in 2010/2011. Between 2006 and 2009 only three of eight potential spring pulses were conducted, the May pulses in 2006 and 2009 and the March pulse in 2008 (USACE Annual Reservoir Control Summaries for 2007, 2008, 2009 and 2010). Four were cancelled because there was not enough water in the system and the fifth because the forecasted flows were in excess of the downstream flow limits. Figure 22 shows the hydrograph of the Missouri River at Nebraska City, Nebraska for 1879, 2006, 2008 and 2009. So even though spring pulses do occur when the conditions permit, most are cancelled because of too little or too much water in the system. Those that occur are of such a small magnitude that there is no chance of impacts to landowners along the river. They are also of such small magnitude that they probably have little chance of providing the benefits that they were intended to provided. This is the result of the process that was used to design the criteria. We hope that as part of the adaptive management process that by studying both these and other larger natural flow events that we can determine if there are benefits from spring pulses and what magnitude of pulses are required to achieve those benefits. Although pulses were scheduled for all runoff scenarios in 2011, the March pulse was cancelled because of high downstream water stages and the May pulse because the extremely high runoff necessitated that the pulse for endangered species management be cancelled so that higher releases than would have been permissible under the technical criteria for the May pulse could occur for flood risk reduction. Surprisingly there have been many negative comments regarding how water management for least terns and piping plovers on the Missouri River was partially to blame for the duration, timing and or magnitude of the flood in 2011. People along the river in eastern Nebraska and western Iowa believe that management for endangered birds impacted the way the system was managed. They believe that some action was taken by the USACE that benefited the least terns and piping plovers and subsequently resulted in a flood that was higher, arrived sooner or lasted longer than would have occurred without that action. To summarize what happened in 2011, the reservoirs were used to store as much runoff as possible and releases were only increased as reservoirs reached storage capacity. We must point out that everything that happened that resulted in the record runoff happened before any actions would have occurred for any type of least tern and piping plover management. We can only assume that they believe that the actions taken to manage the system were actually taken for bird management. We disagree, because the rising water levels in the reservoirs obviously eliminated all of the nesting space on the reservoirs with the implied understanding that this action of storing this amount of water would necessitate high releases from the system which would then flood all of the nesting space on the river. We cannot identify any benefits for least terns and piping plover in how the USACE managed the river in 2011 and therefore at a loss to fully comprehend these comments directed at the least terns and piping plovers. The construction of chutes, backwaters, emergent sandbars and shallow water habitat have not contributed to the flood but in most cases actually increased flood storage of the system resulting in reduced flood heights. We have found no evidence that management actions were taken for either least terns, piping plovers or pallid sturgeon during 2011. All scheduled actions were cancelled as the runoff forecasts increased and therefore did not contribute to the magnitude, timing or duration of the flood. This is an excellent analysis and description of the river's management and conditions that produced this year's flooding. I've looked at much of the same data the author did and reached similar conclusions over a month ago, that the system functioned as designed, holding back water behind the dams as long as possible before letting it out as a controlled flood. The article lists only one author yet uses "we" throughout. Please clarify that. Who is the "we" behind this analysis? I myself did all of the analysis and writing for the article. This update was originally written as an update to agency staff. It was my intent to have my program staff assist me with both the analysis and writing, but because of their involvement with our flood monitoring, they only participated by providing editorial comments. Because it went out to the agency as an update from my program without an author, I just left it as 'we'. But when Prairie Fire asked to use the update, and subsequently asked for the authors rather than use the staff reference, we simply missed the fact that by listing a single author, it would not match how the document was worded. I apologize for any confusion. Nice article thank you for writing it. Recommend you revise the timeline for February 1 though- "Total flood storage available was 96.4%. Rocky Mountain snowpack decreased slightly during June and was now 112% of normal above Fort Peck and 111% of normal above Garrison" Should read January instead of June. I have read your article and I still believe that having only 22% of total capacity as flood capacity (flood [6%] and flood/multi-use [16%]) is flawed. So when you write that there was 97% flood capacity, or some high figure, the fact is that it is not really quite true and misleads uninformed readers. Further, the 2010 year saw a high water flood situation for eighty-nine (89) days straight at Nebraska City. I personally drove the levee every other day for much of that time in the area south of the Highway 2 / Nebraska City bridge. Yet, when that flood was over, we promptly forgot the lesson the river was trying to teach us. So ... in retrospect, I saw this 2011 flood coming alot sooner. It really started with a COE decision sometime in the Fall of 2009, to have 2010 over-winter levels at 78% full -- that is just too high and leaves no room for error or "catch-up". And now the COE is in an untenable situation because they are not going to run the reservoirs down to a low enough level as to prevent major flooding in 2012. They are not going to "catch-up". This is a bad decision. Farmers in the Valley from about Percival, Iowa, south are not going to be able to get crop insurance and no sane banker is going to loan them money - until the COE gets the levees fixed in 3 places (one break is over 1000' and try fixing that in January at 10 degrees in a snowstorm) and I question if those breaches are even of a high enough priority. I have no confidence in the COE planning; I believe they have written this 100 square mile area "off" for several years, but they won't say so because that would indicate errors in their management. There are groups trying to figure how to go forward. Barge navigation north of St Joseph has got to be abandoned, the river slowed and the levees on each side of the river ought to be reset another 1/4 mile further out. Thus giving the river a bit more area to spread out and providing communities, small businesses and farmers a greater protection from high water, seep water and environment killing floods. That would require farmers selling about 30 sections of land on the Iowa side and a pretty extensive construction project ($400 million maybe). Again, some of us saw this one coming in the summer of 2010, but few were really understanding the future of 2011. Certainly, I would not argue that this flood could be avoided, but its effect could have been substantially reduced IF the over winter levels were set at 60% of TOTAL capacity. Barges and the Missouri Stakeholders are "driving" the COE and there is factual evidence to support that. Navigation from May to November ON THE MISSISSIPPI RIVER is the biggest cause of flooding because they cause the COE to store between 12 and 17 MAF for them. The economic benefit to the midreach states is nil compared to the $$$ of barges on the Mississippi and of walleye fishing etc in the Dakotas. The politics is still there as I see Missouri politicians manuever to get control of investigations and steer the outcomes in their favor. I do not trust what I have read and heard so far. I guess I have to be "shown". We welcome all readers to submit essays in their particular area of expertise without regard to party affiliation or political philosophy. Readers are also welcome to recruit writers that they would like to see published in Prairie Fire. We only publish original materials and do not publish ghostwritten materials or press releases. 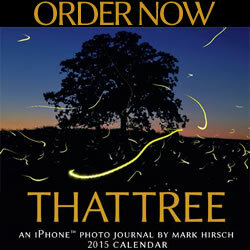 Thank you for catching the mistake, we have made the corrections of June to January. Man this left right stuff has to go.... Seriously. I have found considerable facts supporting these conclusions for months... from all types of sources.. and besides the statements do not appear politicly biased in any way.. rather it's been my take from the media that everyone looking to pin 'blame' is looking for either cash or political leverage. Not much profiteering going on in this article from what I gathered on first read. Thank you for all the effort and the will to post it. You go Mr Flooding, hang in there this Oklahoma Indian (aka; Transplanted MO RIV RAT)is behind you. Thank you for the article outlining all the factual information regarding the Flood Event of 2011. As an evacuee of this flood, (and one who most likely will be looking at losing their home), I have some serious questions regarding how anyone could possibly come to the conclusion that the Corps was correct in their handling of this event. As we see more and more email conversations between Jody Farhat and the observers at different locations up the river, it seems that there has been no mention of the tremendous high ground saturations percentages that existed prior to the runoff. Nor is there anything to mention in this article how routinely people up the river wrote indicating that this flood event was going to be "one for the ages." Most of these observations were either ignored or dismissed as the COE seems to feel they know more than the people on site. I am not an engineer, nor a hydrologist, but I do know that saturated ground will not soak up precipitation or runoff. Some reports indicate that most of North and South Dakota were near the saturation point long before the unusual rain events occurred. As a final piece to ponder, yes the COE did follow the manual and did everything by the book, but how can a person with any higher order thinking capabilities slavishly follow a manual that does not address the current circumstances. In other words my driver's manual told me to drive on the right hand of the road, but if I see a semi coming at me, I think I would switch lanes. In my opinion the COE knew what they were up against much earlier than this article indicates, yet they drove the river, and many of us right in to the semi.